Joachim Stutschewsky’s life and work and his artistic milieu. Joachim Stutschewsky (1891-1982) was a composer, cellist, musicologist, and folklorist born in Romni, Ukraine in 1891 to a well-known family of klezmorim. 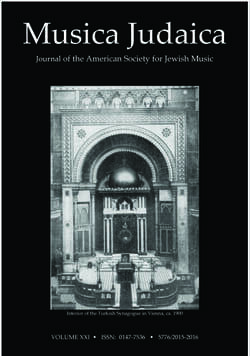 Involved in both Jewish music as well as avant-garde classical music, Stutschewsky was one of the founding members of the Kolisch Quartet, which premiered important works of Arnold Schoenberg, as well as an avid supporter and composer of classical music infused with Jewish folk music. After studies in Zürich and years in Vienna, Stutschewsky moved to pre-state Israel in 1938 where he taught cello, performed, lectured, and championed the music of Israeli composers. Performances by Julian Schwartz, Marika Bournaki, Avi Nagin, andAlec Manasse will feature a variety of chamber music by Stutschewsky and composers of his coterie both in Russia and in Israel, as well as a new composition by Ofer Ben-Amots commissioned by YIVO for this concert. Born in Seattle into a musical family, cellist Julian Schwarz is already being recognized as a cellist destined to rank among the finest of the 21st century. Mr. Schwarz made his orchestral debut at the age of 11 playing the Saint-Saens Concerto No. 1 with the Seattle Symphony with his father, Gerard Schwarz, on the podium. Since then, he has appeared with the Seattle, San Diego, Puerto Rico, Columbus (OH), Syracuse, Virginia, Sarasota, Grand Rapids, Omaha, Wichita and Modesto symphonies among others, and performed recitals at the Casals Festival in Puerto Rico and in Palm Springs. He also appears regularly on the stage of Bargemusic in New York City playing chamber music and recitals with his regular recital partner, pianist Marika Bournaki. Mr. Schwarz’s recent and upcoming performance highlights include debuts with the Charlotte, Des Moines, West Virginia, Chicago Camerata, Toledo, Amarillo and Washington/Idaho symphonies, The Louisville Orchestra and Symphony Silicon Valley in San Jose; return engagements with the Hartford and Boca Raton symphonies and the Northwest Sinfonietta; and recitals in Palm Springs, Washington, DC, Pennsylvania and Nova Scotia. Internationally, he made his Australian debut with the Queensland Symphony in Brisbane as well as his debut in Hong Kong appearing at the Intimacy of Creativity Festival. He also returned to the Boca del Rio Orchestra in Veracruz, Mexico and made his debut with the Mexico City Philharmonic in June 2016. Marika Bournaki is pianist committed to distinctive interpretations of standard repetroire, commissioning works by younger composers, and collaborating with artists from various fields. Marika was featured in the award-winning documentary, “I am not a rock star”, directed by Bobbi Jo Hart and featuring Marika, and her performances can be heard on Radio-Canada, Radio-France, BBC, WQXR in New York City, and Toronto’s Classical 96.3 FM. She has been featured on television networks such as ERT, TF1, France 2, CTV, Global, Radio-Canada, CBC, and Canal+. Marika holds a Bachelor’s degree from the Juilliard School of Music, in New York. (Concordia Institute for Canadian Jewish Studies).